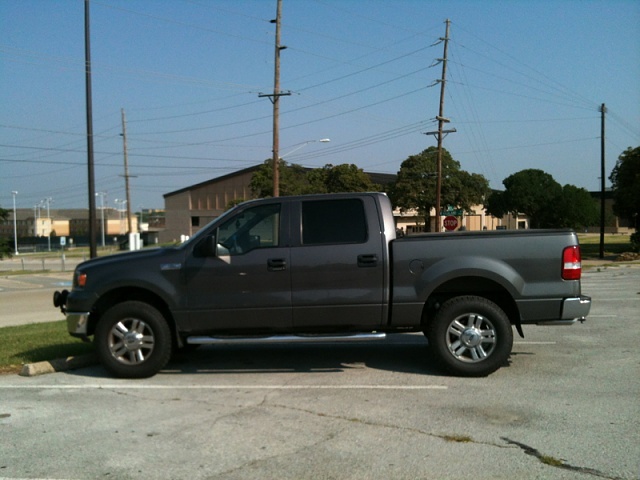 This article show a guide on how to install rear blocks for Ford F150. Will need two 2” rear blocks, 8 nuts along with 4 u-bolts which are 2” longer than the original u-bolts, and two shocks which are approximately two inches longer than the original shocks. Instructions are for both sides. Do same step to both sides. 1) Put e-brake on and block front wheels. 2) Break the nuts on the wheels but leave snug until vehicle is jacked up. 3) Jack the rear end up using the hydraulic lift in the middle of the rear differential on a flat surface until the tires are slightly off the ground. 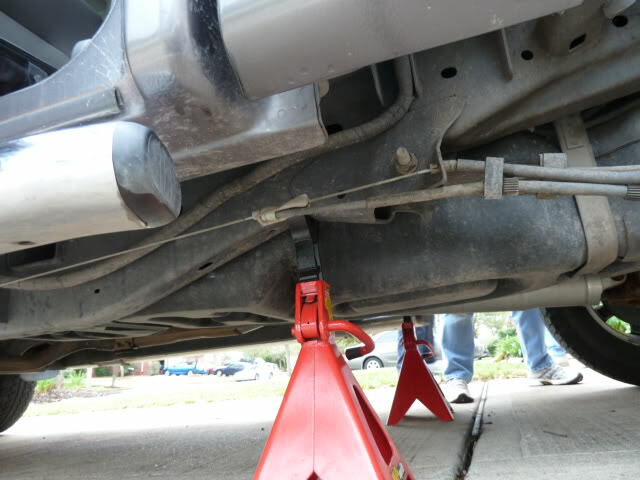 4) Place jack stands under the frame rail on each side. 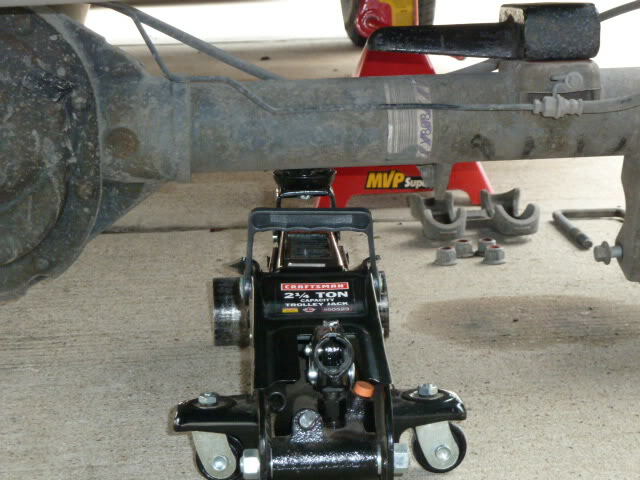 Lower the jack on the differential until the frame sits on the jack stands and make sure they are secure on the frame. 5) Remove both rear tires. 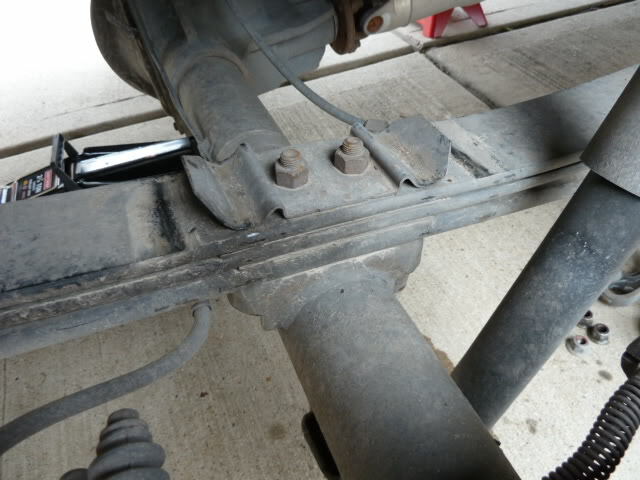 6) Lower the hydraulic jack until it is just barely holding the axle up to relieve the pressure on the leaf springs, but do not have it loose contact with the rear differential. Be careful, the springs will jump if there is still pressure on them. 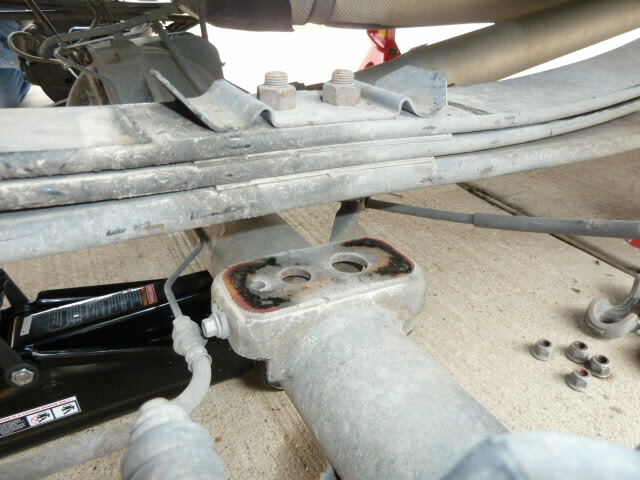 7) Remove the u-bolts that hold the leaf springs on the axle. 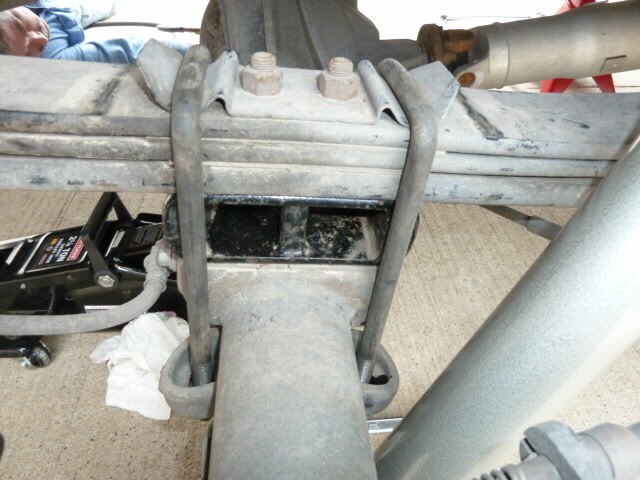 Set the lower brace that comes off when you remove the nuts on the ground indicating which way it came off. 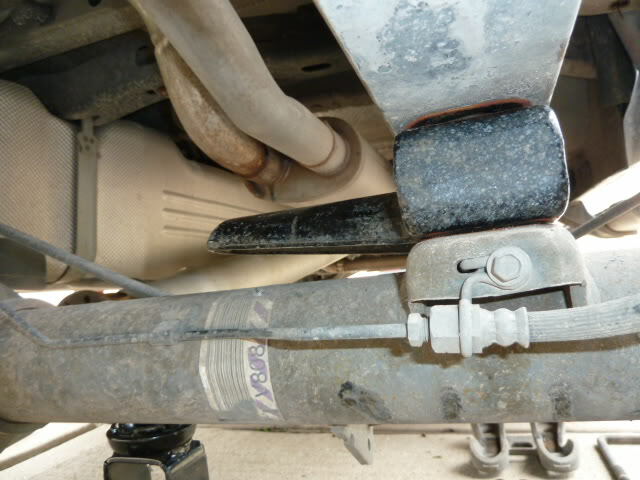 8) Remove the original shocks (lower jack on differential if shocks are not stretched completely. 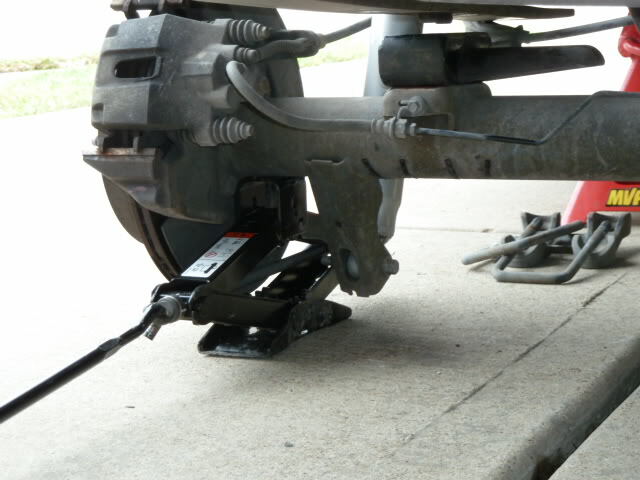 10) Lower the axle onto the support blocks or jacks so you have enough room to place the rear blocks between the leaf springs and axle. 11) The rear blocks have pins on the bottom that fit into the small holes in the axle and the blocks also have holes for the pins on the bottom of the leaf springs to go in. Place the blocks on the axles with the pins in the holes as shown with the bump stop pointing toward the differential. 12) When they are in place jack the axle up so the pins fit in place on the bottom of the blocks and on top of the blocks. May need to bump the axle or blocks in order for the pins in the leaf spring to go into the holes on top of the blocks. 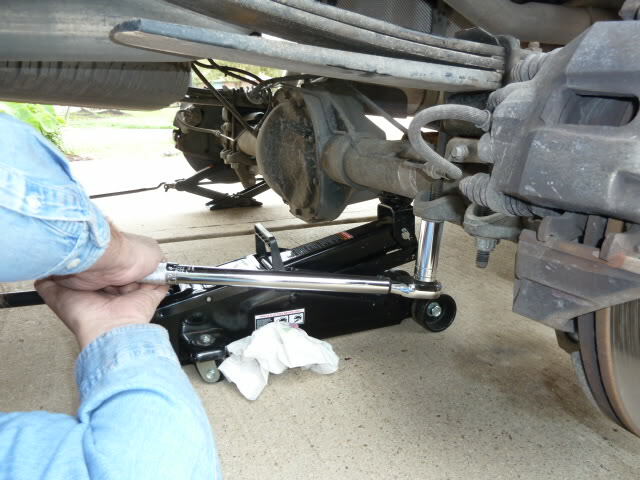 13) Keep raising the axle until pressure is put on the leaf spring (make sure the truck does not lift off the jack stands supporting the frame). Once pressure is put back on the leafs springs put the lower brace back on using the longer u-bolts and the nuts that go with them. Tighten the bolts until they are snug. 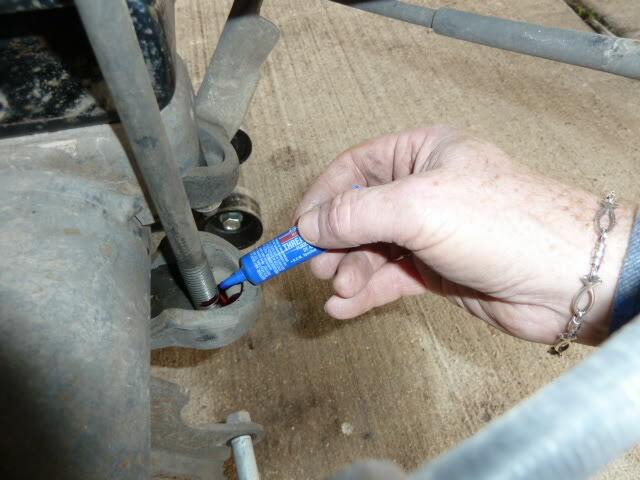 14) Apply RED loctite to the u-bolt nuts and use torque wrench to tighten to 100 ft/lbs in 3 steps – Tighten nuts to 50 ft/lbs, then to 75 ft/lbs and then to 100 ft/lbs. 15) Install the new shocks. May need to compress them in order to place them where they bolt on. 16) Mount the wheels back on the truck and snug up the lug nuts. You may need to jack the truck up more since the 2” block lowered the axle. 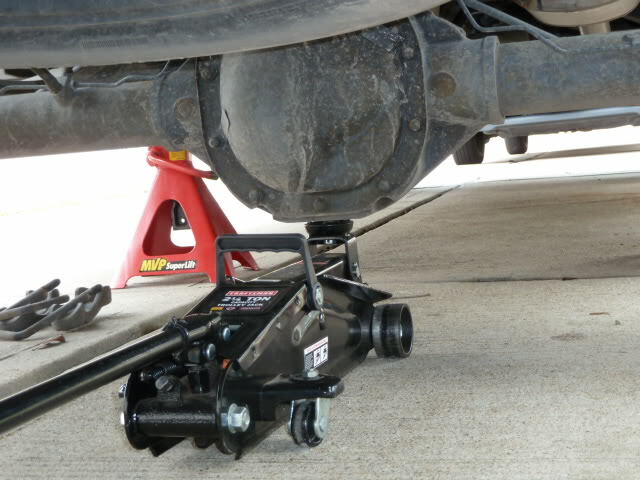 Once the lug nuts on both wheels are snug, lower the truck back onto the wheels removing the jack stands and jack. Tighten the lug nuts to 150 ft/lbs of torque. 17) Remove the blocks that are holding the front tires.